"L'Hôtel de France", a few steps from the "Cité de l'Ecrit et des Métiers du Livre", offers thirty-five comfortable and air-conditioned rooms. During your stay you can enjoy its fitness room and also discover the restaurant’s lively and inventive cuisine, renewed every season, with its fresh local produce. 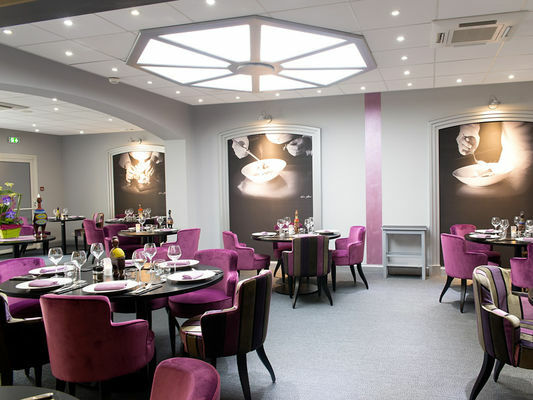 This fully air-conditioned restaurant with a refined atmosphere offers two types of catering: a brasserie and a gourmet restaurant. The brasserie serves simple meals produced using high quality products and offers an à la carte menu that changes every week and set menus from €13.90. The gourmet restaurant serves a lively and inventive cuisine which evolves with the seasons, and offers set menus from €28.00. "Le Lucullus" brasserie is open at lunchtimes all year round from Sunday to Friday, and the gourmet restaurant is open at lunchtimes all year round, except for All Saints' Day, from Wednesday to Sunday. That little extra something: seasonal cooking and a vegetarian menu. There is no review about Le Lucullus Hôtel De France, be the first to leave one !